My sister Bunny has chickens! They are Dominiques, about five months old. On Friday I got to visit them for the first time. I was so excited that I arrived for my visit before Bunny even got home from work. So while I waited for her I peeked in at the chickens and admired their marvelous coop built by Bunny's husband, Matt. The coop looks kind of like a screen porch, tall enough that you can walk around inside. It's whitewashed, very shabby chic, with heirloom roses cascading over the roof and ageratum crowding close around the sides. The nesting boxes have fancy antique hinges. When Bunny got home I was walking in the yard, admiring all the shiny hot peppers in her garden. It was such a clear day, and there was a hint of fall in the air--which is terribly exciting to Floridians worn out by hot, miserable August. I was dreaming about Halloween. "Have you seen them?" Bunny called. "I peeked in at them," I said. "I was sitting in the cabana, spying on them." We went to the coop. "Beatrix is the darker one," Bunny said. "And Millie is the one with more white. Hold on. I have a plum for Beatrix. Plums are her favorite food." Bunny explained that Beatrix was a busybody and Millie was more docile and retiring. She held out the plum and Beatrix came hurrying over. "See?" Bunny said. "She's also piggy." As Beatrix pecked at the plum, Bunny said, "Whenever I’m holding Millie, Beatrix has to come over and find out what’s going on. She thinks everything's her business." Bunny said you have to feed chickens only organic fruits and treats because they're really sensitive to pesticides. "Millie's favorite food is bread," she said. And she fetched a slice. We sat there feeding the girls bread crumbs (Beatrix also seemed quite fond of bread), and they made soft little cooing sounds as they gobbled the crumbs out of our palms. "When Matt first brought them home, I thought Millie was the nicest one," Bun said. "Because when I went to get her out of the box she was huddled in a corner basically purring. Beatrix wasn't as cooperative. She flew. She went up into a tree." 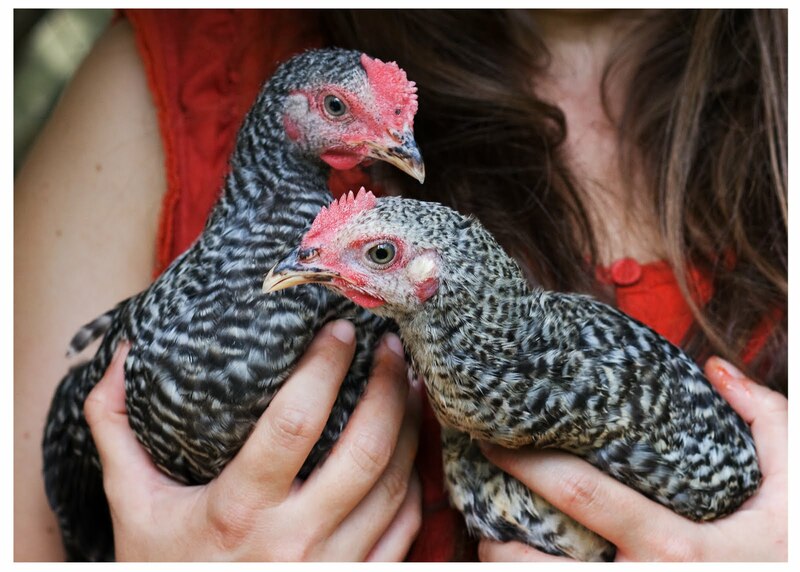 But now both chickens love to be petted and held. I got to hold them! It was so much fun. If you just hold their wings down gently, they relax and settle right down in your arms. Their feet are surprisingly warm, and their feathers are so soft. I was in heaven sitting in the sawdust in the chicken coop, cuddling with fluffy, tame chickens. I could have sat there all day. But Bun and I had to go get Jake his birthday presents--and shopping is not a bad thing to have to do.